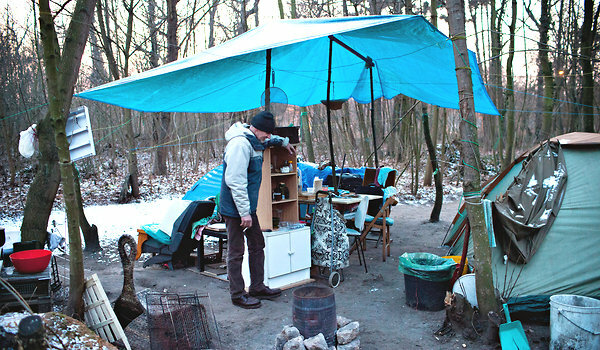 Jean, 51, an electrician, lives in a shelter in the Bois de Vincennes, a park behind a parking lot in eastern Paris. PARIS — When Melissa Dos Santos leaves her job at the end of each day, she goes home to an unlikely place: a tiny trailer in a campground 30 miles north of Paris, where scores of people who can barely make ends meet are living on a sprawling lot originally designed as a bucolic retreat for vacationers. Melissa Dos Santos, 21, and Jimmy Colin, 22, live in a trailer in a campground 30 miles north of Paris. People camp in the parking lot of the Château de Vincennes, a splendid 12th-century castle in eastern Paris. “I grew up in a house; living in a campground isn’t the same,” Ms. Dos Santos, 21, said wistfully. Europe’s long-running euro crisis may be cooling. But the economic distress it has left in its wake is pushing a rising tide of workers into precarious straits in France and across the European Union. Today, hundreds of thousands of people are living in campgrounds, vehicles and cheap hotel rooms. Millions more are sharing space with relatives, unable to afford the basic costs of living. These people are the extreme edge of Europe’s working poor: a growing slice of the population that is slipping through Europe’s long-vaunted social safety net. Many, particularly the young, are trapped in low-paying or temporary jobs that are replacing permanent ones destroyed in Europe’s economic downturn. Now, economists, European officials and social watchdog groups are warning that the situation is set to worsen. As European governments respond to the crisis by pushing for deep spending cuts to close budget gaps and greater flexibility in their work forces, “the population of working poor will explode,” said Jean-Paul Fitoussi, an economics professor at L’Institut d’Études Politiques in Paris. To most Europeans, and especially the French, it seems this should not be happening. With generous minimum wage laws and the world’s strongest welfare systems, Europeans are accustomed to thinking they are more protected from a phenomenon they associate with the United States and other laissez-faire economies. But the European welfare state, designed to ensure that those without jobs are provided with a basic income, access to health care and subsidized housing, is proving ill-prepared to deal with the steady increase in working people who do not make enough to get by. The trend is most alarming in hard-hit countries like Greece and Spain, but it is rising even in more prosperous nations like France and Germany. “France is a rich country,” Mr. Fitoussi said. “But the working poor are living in the same condition as in the 19th century. They can’t pay for heating, they can’t pay for their children’s clothes, they are sometimes living five people in a nine-square-meter apartment — here in France!” he exclaimed, speaking of an apartment of about 100 square feet. In 2010, the latest year for which data were available, 8.2 percent of workers in the 17 European Union countries that use the euro were living under the region’s average poverty threshold of 10,240 euros, or about $13,500, a year for single adult workers, up from 7.3 percent in 2006, according to Eurostat. The situation is nearly twice as bad in Spain and Greece. While direct comparisons are difficult because of different standards, the Labor Department estimated that 7 percent of single adult workers in the United States earned less than the poverty threshold in 2009 of $10,830 in 2009, up from 5.1 percent in 2006. France fares better than most European countries, at 6.6 percent, but perhaps nowhere is the phenomenon more startling. While the country seems to exude prosperity, the number of working poor is up from 6.1 percent in 2006, and experts predict it will grow. In France, half the nation’s workers earn less than $25,000. The median monthly paycheck is $2,199, 26 percent above the average for the entire European Union. But the high cost of living and the difficulty many people face securing affordable housing (home prices have surged 110 percent in the last decade, and most rentals require large advance deposits), leaves a growing number out in the cold. Ms. Dos Santos and her boyfriend, Jimmy Collin, 22, moved to the trailer because they did not want to live with their families and lacked upfront money for an apartment. Mr. Collin, a high school graduate with some additional technical training, searched for work for more than six months before landing a minimum-wage contract last year, at $1,800 a month, cleaning streets near Parisian jewels like the Eiffel Tower. He gets a small government stipend for low-income earners, but they still found it hard to save after paying taxes and living expenses. The wait for subsidized housing is more than five years. Ms. Dos Santos, also a high school graduate, jumped at the job at a Carrefour supermarket after she failed to find work through one of France’s national employment centers, where counselors meant to handle 120 cases have been overwhelmed lately with up to 500 each. But her boss will not let her work more than 35 hours a week, and she cannot find supplemental jobs. “It holds people back,” she said. Today, up to 120,000 people are living in French campgrounds, according to Observatoire des Inégalités, a social watchdog group. While it is not a new phenomenon, officials say it is accelerating. And even some people with middle-class jobs are living on the edge. Bruno Duboscq, 55, a human-resources manager at a small company in central Paris, moved into a recreational vehicle in the parking lot of the Château de Vincennes, a splendid 12th-century castle in eastern Paris, three years ago when the expense of a small apartment left him with too little money at the end of the month. One February evening, as the thermometer showed minus 6 Celsius (21 degrees Fahrenheit), he opened the door to his camper and showed off a small kitchen, a TV, two beds and a tiny shower. Living in an official campground would have been better, but at about $40 a day, he said, it was too expensive. Many of them are on temporary contracts that employers are increasingly using to replace permanent jobs, which carry benefits and job protections that many employers are reluctant to take on. Contract labor has surged in the last several years and is set to increase as politicians in France and elsewhere encourage their use as a way to reduce high unemployment. But numerous recent studies by economists and social groups warn they may increase in-work poverty, because they pay less and have fewer benefits. In 2011, temporary contracts accounted for 50 percent of all new hires in the European Union, according to Eurostat. Isabelle Maquet-Engsted, a senior analyst at the European Commission in Brussels, said political efforts to encourage temporary work may only paper over the problems that Europe has in generating solid economic growth and well-paying jobs. “We have signs that things are not going to get better, because the jobs being created are those that carry a higher risk of poverty,” she said. For those who cannot find work after a temporary contract expires, the situation can become dire. In the Bois de Vincennes, a park behind the parking lot where Mr. Duboscq lives, Jean, 51, an electrician who would give only his first name, warmed his hands recently over a fire in a small oil drum. He used to rent a tiny Paris studio, he said, but moved to a tent hidden in the woods three months ago after a fixed-term job expired and he was unable to secure other lodging. By day, the forest is a playground for young urbanites. At night, however, it is home to an estimated 200 people, including families with children. Some are French, some are immigrants from Eastern Europe and North Africa. Like many tent shelters, Jean’s is quasi-permanent. With his neighbors, he shares a rickety table and a shelf stocked with sugar, salt and an old teapot. Strips of meat hung frozen on a clothesline. Matthieu, 31, a construction worker living on fixed-term jobs, wonders why European leaders seem focused more on protecting financial institutions than on helping people like him. France enjoys a beautiful image, he said one recent evening in the Château de Vincennes parking lot. “But it’s not like Anglo-Saxon countries,” he said. “There, you arrive, you know how to do something — you can climb. That’s the American dream. Copyright 2012 The New York Times Company. Reprinted from The New York Times, International, of Monday, April 2, 2012.